The Little Mushroom is located in Dallas Texas. I personally like to serve this with some steamed rice. One bonus is that you can use a cheaper chicken bone in breast for this delightful creation. This is a sinfully rich dish, perfect for hearty eaters. You can make Little Mushroom Chicken Avocado just like they do. In a large pot simmer the chicken breasts, in enough water to cover, with the celery onion, salt, and pepper, until tender. Remove from the stock and cool. Debone and shred into bite-size pieces. Strain the stock and refrigerate for another use. Combine the chicken, mayonnaise, soup, soup base, and curry powder. Place a few avocado slices in each lightly greased individual au gratin dish. (You can also bake this in a 13 x 9 baking dish or even a casserole dish.) 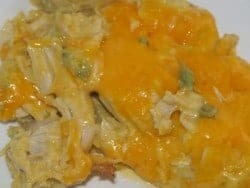 Pour chicken mixture over the avocados and top with the cheese. Bake about 20 minutes at 350 degrees or until bubbly. I made this last night – it was outstanding. Even with light mayo, it was rich enough that serving it over rice was a necessity for us, not an option. If you aren’t going to use the leftover chicken stock, simplify the recipe by skipping the onion and celery. The curry, CoC and boullion overpower any flavor hints they might have added to the chicken while simmering. Fast forward a year and a half, and this is still one of our favorite recipes. We make it at least once a month. You know this is one of my favorites as well. My only regret with this recipe was I didn’t find sooner.